Market View by David Atherton: Why did Quindell drop 20% this morning? "All this assumes no material news, good or bad, about the company"
Well there hasn't been any material news. All good news so far has failed to drive the price up. I presume the first comment was from a holder who doesn't believe in charts. Certainly not a meaningless article - it is the Private Investor who gets to hear last and if there is any news forthcoming the shares will no doubt react before the RNS - and that's where charts have a advantage! Thanks, second anon poster. The fact that the share is in short-term decline is a given. I am just trying to explain using TA where it will go next in the short-term, allowing people to make money day and swing trading. News may detemine direction but technicals determine the size of the price move, eg earnings tend to move a share up or down to existing resistance points. Charts work best when there are no RNSs, and buying is being done by algos. re 'not believing in charts' can either of you recommend any good books for a good education? There are hundreds. Just search "technical analysis" or "charting" and "beginners" on Amazon. There has actually been some pretty big news released over the last few trading sessions in this stock, plus some serious allegations which is where the 20% drop came today. Nice analysis on the resistance points David, an interesting insight. I'm very new to TA like one of your other posters but was just wondering about the Algos you mention above. Quindell seems to be HEAVILY moved around by the Algos, and watching L2 I can pretty much see it happening, but I'm always a bit too slow or a bit too indecisive (recognising my lack of experience) to make a move. Do you have any advice around specifically learning the behaviours or Algos such as on this instrument, and how to use this to time entries and exits? A guy on one of the boards earlier (not sure if it was you!) mentioned that the Algos were behaving quite predictably and not doing a very good job and as such it was fairly easy to sell the Algo rallies. Algos just follow technical trading rules like I do. Follow the trend (buy when rising, short when falling), looking for pivots (reversal points), which can be previous reversal points, or technical indicators such as moving averages, RSI <30 or >70, fibonacci retracement levels etc. So If you follow technical rules, you will gain. QPP is headed for 80.75p, the previous reversal point from May 9, 2013. However the RSI is now under 30, so that is slowing it's descent. Some algos are buying, but more are selling. 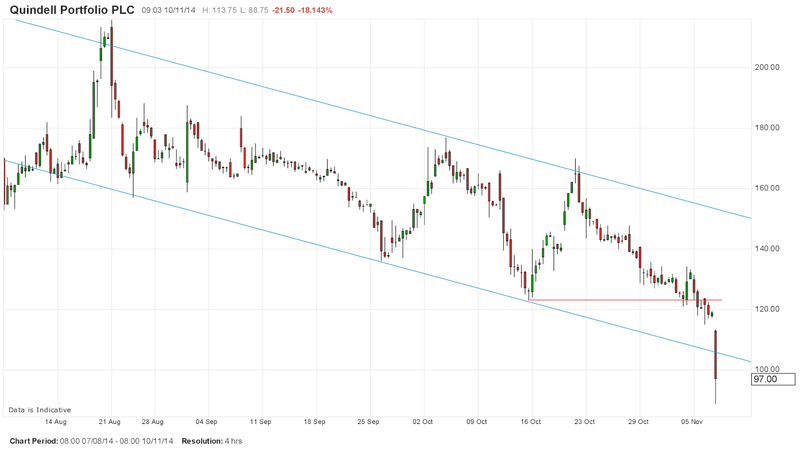 Looks like a spot on shout from you also in terms of the decline towards 80.75p! With regards to pivot points, do you look at those as exits to avoid a large reversal against you, or are there indicators you look for which suggest another level could be taken? 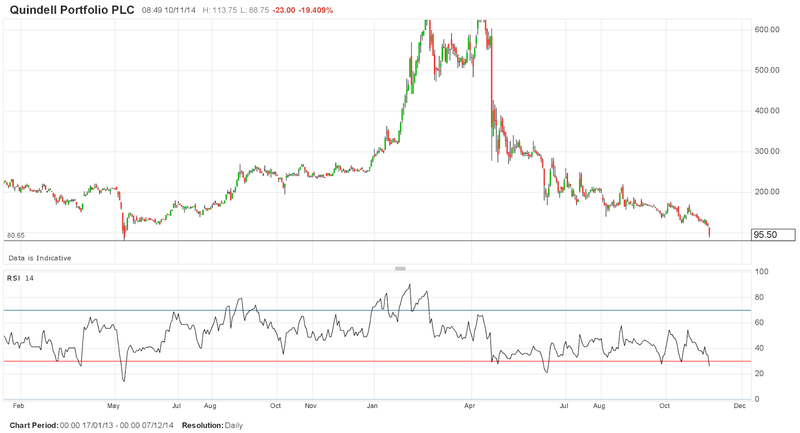 For example the QPP drop today is now looking heavily oversold on the RSI heading to your pivot point, what would you be looking at in terms of assessing where to go next? Many thanks in advance for your response. I'm currently watching whether the next historic support level (and all time low) will be broken at 76.87p. Hi David, been following your posts over the past few days..
Whats your view on the 'Race to Zero' with these algos, as you know there algorithms predicting the ones predicting the one placing 10,000 trades a second. How is there reliable money to be made day/swing trading over next few years? It seems your putting yourself at a disadvantage going head to head with the machines, or am I wrong?